LEXINGTON, Ky. (Aug. 15, 2011) — The University of Kentucky Research Foundation has been selected by the U.S. Department of Energy (DOE) to receive $14,502,144 to help develop ways to reduce the cost and improve the efficiency of advanced carbon capture systems used at coal-fired power plants. The project, titled "Application of a Heat Integrated Post-Combustion CO2 Capture System with Hitachi Advanced Solvent into Existing Coal-Fired Power Plant," will be headed by the Power Generation and Utility Fuels group at UK's Center for Applied Energy Research (CAER) and will take place at LG&E/KU’s Brown Power Plant. "This funding announcement is good news for UK, but more important, it is good news for all Kentuckians," said Gov. Steve Beshear. 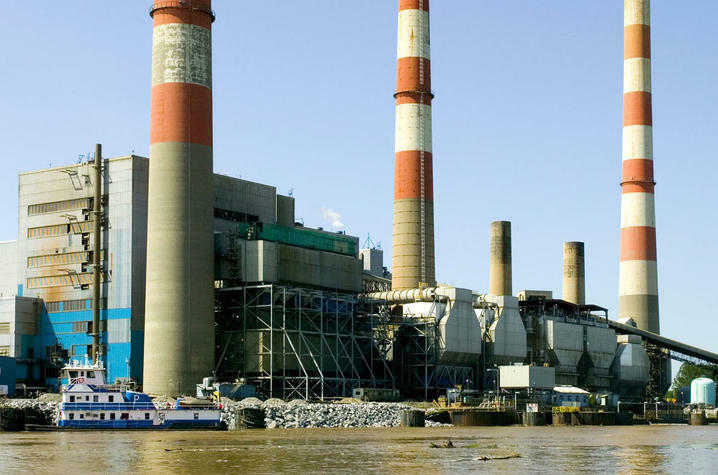 "Managing power plant emissions from existing facilities is necessary to ensure our traditional manufacturing economy, our mining industry, and our citizens can prosper in the face of increasingly more stringent federal regulations." The project will demonstrate a carbon dioxide capture system that uses an innovative heat integration method that takes advantage of waste heat from existing fossil power plant technologies. The proposed process will significantly improve the overall plant efficiency when integrated with the CO2 capture system, and can be utilized to retrofit existing coal-fired power plants. Kunlei Liu, associate director of the Power Generation group at CAER, is serving as principal investigator of the project. "The research in this program will not focus on any specific technology to capture and concentrate CO2 from coal-based power plants, rather it will take a holistic approach and utilize energy from the power plant that is normally wasted, in order to drive the processes to capture the CO2 using a variety of available technologies," Liu said. Advanced CO2 power plant capture systems are a key element in carbon capture, storage and utilization (CCUS) technologies, considered by some energy experts to be among the important options for reducing greenhouse gas emissions associated with possible climate change. Existing carbon capture systems currently require large amounts of energy for their operation, resulting in decreased efficiency and reduced net power output when compared to plants without CCUS technology. These penalties can add as much as 80 percent to the cost of electricity for a new pulverized coal plant. According to the DOE release, "the overall goal of this research is to develop CO2 capture and separation technologies that can achieve at least 90 percent CO2 removal at no more than a 35 percent increase in the cost of electricity. This would represent a significant improvement over projected increases in electricity costs using existing technologies." The other major participants in the project include: the CAER Carbon Management Research Group’s industry members (America Electric Power, Duke Energy, East Kentucky Power Cooperative, Electric Power Research Institute, and LG&E and KU Services Company), Hitachi Power System American (HPSA), Smith Management Group, Koch Modular Process Systems, and the Kentucky Energy and Environment Cabinet. "This is an example of the university working with industry on research relevant to Kentucky," said UK Vice President for Research Jim Tracy. "It represents the success achieved by working with members of the utility industry for a number of years in the Carbon Management Research Group consortium." Energy and Environment Cabinet Secretary Len Peters says the state has pledged its support for this type of project. "Finding ways to use coal more cleanly in a cost-competitive manner is a crucial element of our state’s future, and we committed our support for this type of project in Governor Beshear’s comprehensive energy plan. We have pledged to work with UK’s Center for Applied Energy Research and industry partners on project planning and provided funding through approval from the Kentucky General Assembly. The DOE funding will ensure the long-term viability of these combined efforts."